After growing up in a country that gets snow every year for 4-5 months, you’d think I’d have tried every winter sport out there. I snowboard (grew up skiing), cross country ski, snowshoe, ice skate and I’ve tried dog sledding, snowmobiling and ice climbing. That should cover it all, right? Well, not quite. Last year I tried a winter sport I’ve never done: skijoring! Originating in Lapland, but now practiced the world over, skijoring is fun, animal oriented sport that’s a great way to stay in shape and keep warm during the winter months. 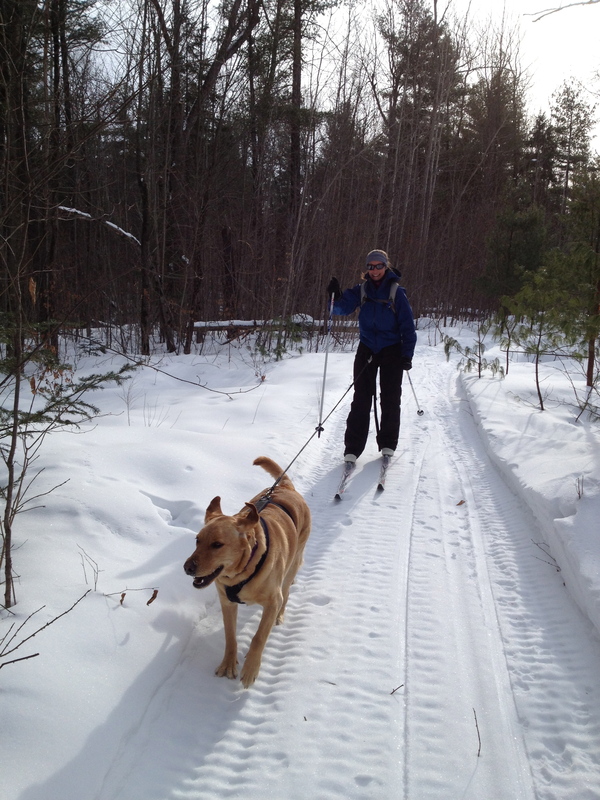 Skijoring can be done with either dogs (most common) or horses, as you’re pulled behind them on a pair of skis. 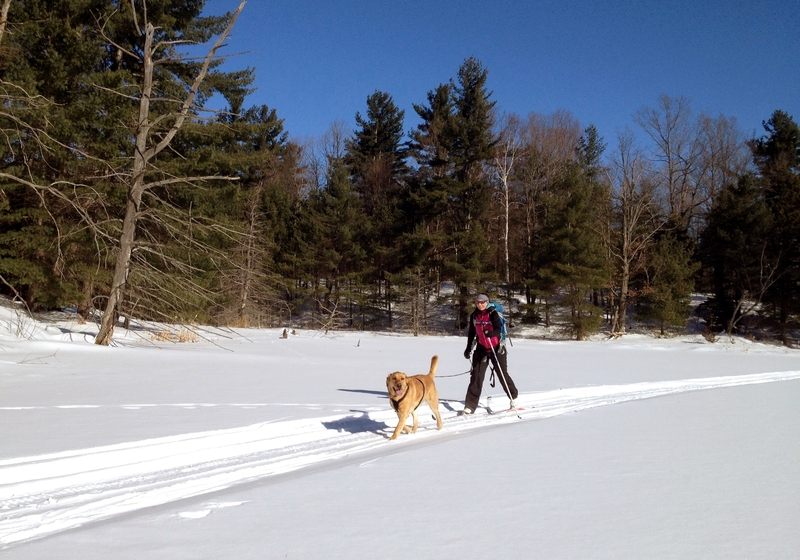 When I tried it, I used cross country skis and a dog named Zoey. My friend had all the equipment and the dogs so I didn’t have to provide anything but warm winter clothing. Equipment needed for this sport include: a harness for the person; harness for the dog; a rope connecting the two with a quick release (just in case the dog sees a squirrel and decides to give chase! 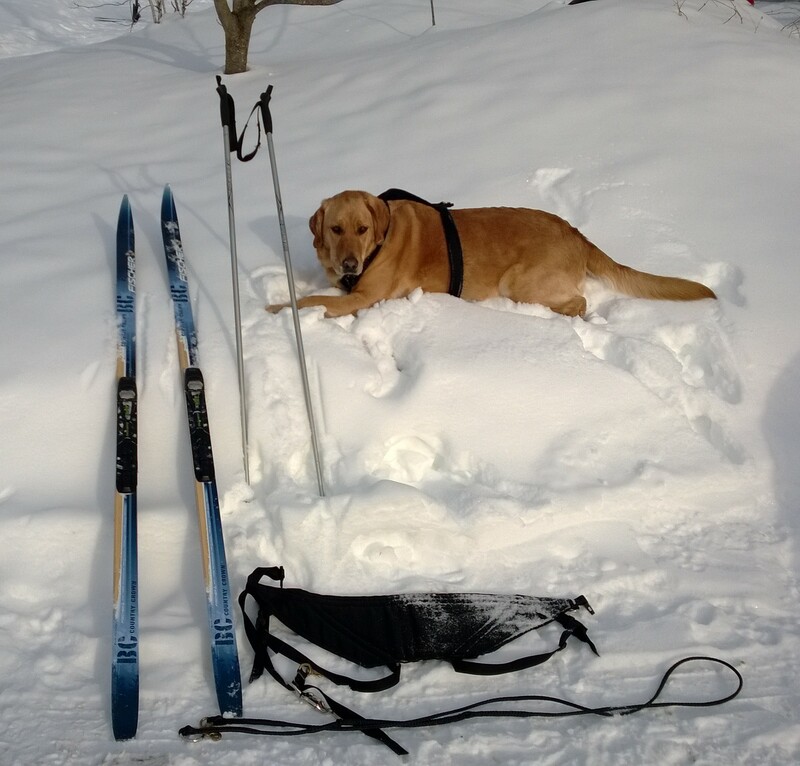 ); a set of cross country skis, boots and poles; good balance and an enthusiastic attitude! Basically you put on all the gear as if you were going cross-country skiing on your own. Then you put on the harness and attach your canine companion and your set! I know what your thinking; how is this a work out for YOU? Doesn’t the dog do everything? Well, not exactly. You still need to ski and provide some forward momentum. The dog is there to compliment your efforts and give you and extra bit of power. My dog Zoey was a tad chubby and whenever I stopped helping (to take pictures usually), she’s look over her shoulder at me as if to say, “Are you going to help me or what?!”. The dogs have to be trained for this sport but my friend said it doesn’t take much for them to understand their role in this whole get up. Its a wonderful way to connect with your canine and gets them out running in the forest on the cold winter days. I’m looking forward to pursuing this sport again this winter! I’d like to extend a huge Thank You to my friend L and her wonderful dogs, Bailey and Zoey. Thank you for taking me out on the trails, teaching me to ropes, taking so many great photo’s and lending me the ski’s and dog! I look forward to trying it again this winter! Have you ever tried Skijoring? What’s the most unusual winter sport you’ve done?